I think that the darwin theory has some gaps, but that they have been dramatized by the media. Yeah, , but that doesn't prove anything. It's normal that's it's very hard to find a squeleton of a creature who died hundreds of millions of years ago in the middle of Africa. In addition, evolution among animal species has been PROVEN. Why? Because we can date any squeleton and rock we find. And with this we managed to date precisely the amount of time a species lived and we can date when it appeared and disappeared. And it's very easy to prove that a lot of species disappeared. Look at the facts!!! Stop being blind!! That doesn't mean God didn't create the earth. 1. What is the application of your so called "creation science"? 2. What is the testable, disprovable claim of your so called "creation science"? 3. What is the testable prediction of your so called "creation science"? a) these are not scientists, they wouldn't know science if it bit them in the ars. b) whether they, or anyone else, believe in evolution is not an argument, it's actually a logical fallacy. a lie is a lie no matter how many people believe in it and the truth is the truth even if no one believes in it. I am not being religious in anyway nor am I trying to preach to anyone I read that essay saw the flaws in the theory and just left the sinking ship. a) well, if you call that crap of a text scientific than that explains why you believe such BS, you obviously can not distinguish between BS and a real scientific paper. Just because someone lists a bunch of important sounding references does not mean they actually used them as such. those are listed so that people like you would BELIEVE them blindly. Science is NOT belief! Science is PROOF. b) stop calling the best proven theory in science a sinking chip, it's pathetic. i know that you don't have any arguments which is why you are reduced to such petty attempts at making a fact seem questionable. it's not. c) i already told you, evolution is a proven scientific fact while theory of evolution is trying to explain that fact and is doing a pretty darn good job. Did you even bother to look at the links I gave you? Sorry, I think I might have just written an entire post which said exactly what you did. My bad. Wait, just one minute there. No evidence of Macro evolution? Have you even bothered to look it up? Just off the top of my head, I can think of DNA, biochemistry, fossil records, and experiments in which macro evolution was observed and documented. The first one is The Law of Biogenesis,attributed to Louis Pasteur, states that life arises from pre-existing life, not from nonliving material. 1. That is not evolution, you refer to the process of abiogenesis, which is a totally separate field of study. The spontaneous generation that Pasteur and others disproved was the idea that life forms such as mice, maggots, and bacteria can appear fully formed. They disproved a form of creationism. There is no law of biogenesis saying that very primitive life cannot form from increasingly complex molecules. 1.The second law of thermodynamics says that everything tends toward disorder, making evolutionary development impossible. -the earth is not a closed system; sunlight (with low entropy) shines on it and heat (with higher entropy) radiates off. This flow of energy, and the change in entropy that accompanies it, can and will power local decreases in entropy on earth. -entropy is not the same as disorder. Sometimes the two correspond, but sometimes order increases as entropy increases. (Aranda-Espinoza et al. 1999; Kestenbaum 1998) Entropy can even be used to produce order, such as in the sorting of molecules by size (Han and Craighead 2000). -even in a closed system, pockets of lower entropy can form if they are offset by increased entropy elsewhere in the system. In short, order from disorder happens on earth all the time. 2. The only processes necessary for evolution to occur are reproduction, heritable variation, and selection. All of these are seen to happen all the time, so, obviously, no physical laws are preventing them. In fact, connections between evolution and entropy have been studied in depth, and never to the detriment of evolution (Demetrius 2000). Several scientists have proposed that evolution and the origin of life is driven by entropy (McShea 1998). Some see the information content of organisms subject to diversification according to the second law (Brooks and Wiley 1988), so organisms diversify to fill empty niches much as a gas expands to fill an empty container. Others propose that highly ordered complex systems emerge and evolve to dissipate energy (and increase overall entropy) more efficiently (Schneider and Kay 1994). No they are not creationist claims this is real scientist giving evidence of why they don't believe in evolution educated people saying they find the theory flawed and do as scientist should they question it and found holes in the theory if you actually read the article you would find out that it is actually scientific essay with a lot of reference links so you can check it out. I am not being religious in anyway nor am I trying to preach to anyone I read that essay saw the flaws in the theory and just left the sinking ship. Damn, we're playing hardball here. First off, I honestly salute you on being able to admit that you made a mistake. That makes you better than 99% of the population. Mistakes are NOT something to be ashamed of nor should anyone see them as a weakness and I applaud anyone who is strong enough to admin that. Now, all you need to do is take that same approach to all other ridiculous creationist claims. And they simply are all ridiculous. Go to talkorigins.org and you should be able to find all the answers, written probably better than I would ever be able to do. I did a little more research on the thermodynamic topic (Just a quick view and nothing esle but haven't researched anything else deep in to see if any other laws apply with what I am talking about. So without further knowledge I will assume that I am wrong) and found that indeed I was wrong but If you are only holding done not reading the rest on a bias of that then the ignorant one is you. And if you think I don't know then shame on you here is a list of highly educated people who tend to think evolution is wrong based form said reasoning on this essay. @Marcus Ulri: no, you are posting lies, not evidence. And no one here is crazy enough to waste time on your BS. It is obvious that you have no idea what you are talking about when you say lies like "the Second Law applies to all systems, open or closed". It's not true. Either you are intentionally lying or you are ignorant. Either way it's a waste of time to argue with you. First of all I have to state that I am a religious person. 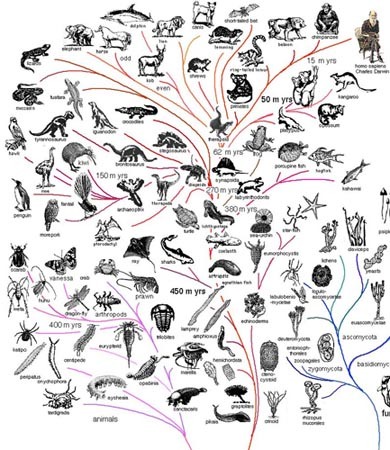 Personally I believe that the theory of evolution, while still a theory, is correct (meaning that organisms evolve, even though we don't yet know all of the details as to what exactly happens). Creationism can be hardly considered a theory, since there is nothing scientific about it. I don't think we should dwell on that, the former is a proven phainomenon, the latter is a denial of science. What we should remember however that science searches HOW, WHERE and WHEN the world was created, while religion searches WHY. A debate on this topic is just silly. The only argument creationists have to offer is "you can't disprove me so that must make me right". By that same logic I could buy a block of cheese, go down to the ocean and try to scare some whales by waving the cheese over the water. If I didn't see any whales I could draw the conclusion that whales are afraid of cheese, if I did see a whale, I could draw the conclusion that cheese actually attracts whales and my whole argument if someone would question my theories would be "well, you can't disprove me so that means I'm right". Stop believing in fairytales, you're not 6 years old anymore, it's about time to be able to recognise something so extremely ridiculous as creationism for the nonsense that it is. It's okay but you didn't even bother to read what I wrote so I will post the parts that you are trying to disprove me and how you haven't done anything. When confronted with the Second Law of Thermodynamics, evolutionists usually use two tricks to try to escape. The first is to state that "it only applies to closed systems, and biological creatures are open systems, so it doesn't affect evolution" (they actually intend to say isolated, not closed, but we know what they mean). The fact is that the Second Law applies to all systems, open or closed, and to all actions and chemical reactions, from molecules to galaxies. The words "except for..." are not in this universal law. A thermodynamics system is simply any part of the universe we want to study. If we are doing an experiment in a bottle, the inside of the bottle is our system and the bottle itself is the "walls" of the system. There are only 3 kinds of systems: if no energy or matter can pass through the walls, it is an isolated system; if energy can pass through but matter cannot, it is a closed system; if both energy and matter can pass through the walls, it is an open system. Now, it is true that the laws of thermodynamics and entropy are defined in terms of isolated systems, because that is the simplest way to express them. However, experts who write textbooks on the subject are quick to say that isolated systems do not occur in nature. For practical applications, a procedure called the Legendre Transform mathematically converts entropy to a variable called Gibbs free energy that is useful for working with real-world systems. Most natural systems are open, but it is convenient to model them as closed. For example, even though a bacterium is an open system, modeling it as a closed system makes it easier to understand chemical reactions in it. You are an open system. You eat food (which comes from outside yourself) and your body survives and grows. Evolutionists believe that all we need is an open system with sufficient energy flowing into it for evolution to succeed. If that were so, you could just stand right behind a jet engine as the aircraft prepares for takeoff, absorb that blast of energy, and evolve to a higher life form. In reality, of course, you would be incinerated because absorbing energy without a mechanism to convert it to a useful form and employ it is destructive or useless. The mechanism must be very specific. Sticking food in your ear will not work; it must go into your mouth and through the digestive system. And the mechanism must be in place and functioning first, before energy is added, or the energy is wasted. The "closed system" ploy is just an attempt to avoid dealing with the Second Law because the Law prohibits any functioning biological mechanism from falling together by pure chance, without assistance or plan, using only the properties of matter. The parameters of the Miller/Urey experiment were to find out if life could have spontaneously generated in an early earth environment, he simulated what was thought to be the atmosphere of the early earth. This environment was composed with high levels of Ammonium, Hydrogen, Methane, and Water vapor. Any chemist worth his weight will tell you that these gasses do not react under natural circumstances, so in order to make up for this Miller added electrical current to the apparatus. (The early earth was thought to have been under constant bombardment by electrical storms at this point in time). Now while Millers concotion did indeed make random amino acids in a jar, and evolutionists used that to mean that life could spontaniously generate, Millers experiment had several flaws. Millers experiment formed 3 of 20 amino acids necessary for human life, however, a portion of the experiment commonly left out of the text books is how he got them. "In vacuum applications, a cold trap is a device that condenses all vapors except the permanent gases into a liquid or solid. The most common objective is to prevent vapors from contaminating a vacuum pump. Cold traps also refer to the application of cooled surfaces or baffles to prevent oil vapours from flowing from a pump and into a chamber. In such a case, a baffle or a section of pipe containing a number of cooled vanes, will be attached to the inlet of an existing pumping system. By cooling the baffle, either with a cryogen such as liquid nitrogen, or by use of an electrically driven Peltier element, oil vapour molecules that strike the baffle vanes will condense and thus be removed from the pumped cavity." In essence, Miller's experimental atmosphere was not capable of sustaining the amino acids for an extended period of time. Miller knew this because in his other attempts without the cold trap(which are conviniently not oft mentioned) Miller could not successfuly make the amino acids. He was only able to sustain the amino acids by removing them from his concoction as soon as they were created by the use of the cold trap. I.E.) Using liquid nitrogen, Miller used the cold trap to freeze the amino acids as soon as they were created and removed them from his apparatus thru a vacuum. This is a strong argument against Miller's case considering as how he couldnt keep his amino acids alive without taking them out of his concoction. Recently scientists have decided that the early environment was not the one which Miller used, they also state that the early earth was not bombarded with lightning as we had once thought. However they still find a way to assert that even if you changed around the atmosphere and removed the constant electrical current, you would still get some form of life building material. Plus added the probability of a protein generating by said Miller's experiment summarily by random chance. Proteins consist of amino acids linked by peptide bonds. Since amino acids have roughly a 50:50 chance of forming peptide bonds to another amino acid, the probability of 4 amino acids forming peptide bond together is ½ X ½ X ½ X ½ = 1/16, or (1/2)4. Since a simple protein usually consists of a chain of 150 amino acids, then the probability of forming the chain is (1/2)150, or roughly 1 chance in 1045. That is the number 10 with 45 trailing zeros. Given that each amino acid has a mirror image, there is one left-handed and right-handed version for each amino acid, the probability of forming one simple protein from 150 amino acids is 1 chance in 1090. One of the most important functional aspects of a protein is the sequence of the amino acids. Since there are 20 biologically active amino acids, the probability of amino acids occurring in a functional is (1/20)150, or roughly 1 chance in 10195. Another way to say that is the probability of finding a functional protein by chance alone is a trillion, trillion, trillion, trillion, trillion, trillion, trillion times smaller than finding a specified particle among all the particles in the universe. Jerry Coyne and Richard Dawkins discretely circumvent the origin of life issue since the event probability was not by chance. Meyer concludes. @Marcus Ulri The second law of thermodynamics states that that matter losses order and increases in chaos (or entropy) IN A CLOSED SYSTEM (Which have no external factors such as radiation or climatic changes) that is not the case of life on earth since we had plenty of external factors that took part at the beginning of life. Evolution isn't linear, to evolve life needs more than energy it need a cladogenetic event that changes the way of life and the world around the specie forcing it to evolve (which takes lots of time) or die (Natural selection) we humans built a society to protect us from natural selection ending the macro evolution process but the fossil record shows evidence of macro evolution ( http://www.talkorigins.org/faqs/comdesc/ ) . Life needs the perfect environment to develop, in earth life begun after we had the necessary amount of radiation, the perfect temperature, with the right compounds that created coacervate droplets that eventually turn into amino acids. The reason of why is so hard to find life in other planet is because it was a complex series of events that will last until the end of life on Earth. The Miller-Urey experiment ( http://en.wikipedia.org/wiki/Miller%E2% … experiment ) proved that is possible to create organic compounds from inorganic ones basically proving that abiogenesis is possible. @Serrgio Das I understand what you are trying to say but you weren't reading me or listening to what was saying. Do you know what a scientific law is? A scientific law is a statement based on repeated experimental observation that describes some aspect of the world. A scientific law always applies under the same conditions, and implies that there is a causal relationship involving its elements. Factual and well-confirmed statements like "Mercury is liquid at standard temperature and pressure" are considered to be too specific to qualify as scientific laws. A central problem in the philosophy of science, going back to David Hume, is that of distinguishing causal relationships (such as those implied by laws) from principles that arise due to constant conjunction. Laws differ from scientific theories in that they do not posit a mechanism or explanation of phenomena: they are merely distillations of the results of repeated observation. As such, a law is limited in applicability to circumstances resembling those already observed, and may be found to be false when extrapolated. Ohm's law only applies to linear networks, Newton's law of universal gravitation only applies in weak gravitational fields, the early laws of aerodynamics such as Bernoulli's principle do not apply in case of compressible flow such as occurs in transonic and supersonic flight, Hooke's law only applies to strain below the elastic limit, etc. These laws remain useful, but only under the conditions where they apply. Many laws take mathematical forms, and thus can be stated as an equation; for example, the Law of Conservation of Energy can be written as , where E is the total amount of energy in the universe. Similarly, the First Law of Thermodynamics can be written as . The term "scientific law" is traditionally associated with the natural sciences, though the social sciences also contain laws. An example of a scientific law in social sciences is Zipf's law. Like theories and hypotheses, laws make predictions (specifically, they predict that new observations will conform to the law), and can be falsified if they are found in contradiction with new data, as with Bode's law or the biogenetic law. I personally believe the the theory of evolution, because everything in that case can be proved, God, the bible, cannot be proved. I see no evidence that any of that exists. The theory of evolution makes perfect sence. I used to believe in God, but then I came to my senses. I see your point of view Marcus, but in the time of Pasteur i think they didn't know about aminoacids (the blocs of life) that can be found inside of metheores. So it's easy to imagine a young earth, full of water, that is hit by a metheore and then it happens some events that create live. About the Law of Thermodynamics, when species envolve there isn't an increase of order because they always stronger adversaries, until they're the strongest and start the self-destruction of their specie (i saw this in Discovery Channel). And as you don't believe in evolution, i don't believe that the Law of Thermodynamics is universal i think it has exceptions. One example is the big freeze the theorie that the caos of the universe will end, because he will continue his expanding and the matter will be sucked by black holes. The theory of Evolution violates two laws of science. The Second Law of Thermodynamics (law of increasing entropy) says that things which start out concentrated together spread out over time. If you heat one room in a house, then open the door to that room, eventually the temperature in the whole house evens out (reaches equilibrium). Knowing how far this evening-out has progressed at any point in time tells you the entropy. Entropy can measure the loss of a system's ability to do work. Entropy is also a measure of disorder, and that is where evolution theory hits an impenetrable wall. Natural processes proceed in only one direction, toward equilibrium and disorder. Things fall apart over time, they do not get more organized. We can overcome this by making a machine and adding energy, but the Second Law prevents such a machine from assembling spontaneously from raw materials. The Law of Biogenesis was established by Louis Pasteur three years after Darwin's book was published, and simply says that life only comes from life. Living cells divide to make new cells, and fertilized eggs and seeds develop into animals and plants, but chemicals never fall together and life appears. Evolutionists often call certain chemicals "the building blocks of life", giving people the false impression that you just stack the building blocks together and you get life. No one has ever done that, including the famous 1953 Miller/Urey experiment where all they got were clumps of amino acids. Many people mistakenly think scientists have made life from chemicals in the lab, but they have not (though many have tried very hard). If one were to succeed, you would know about it. He would get every science award there is, be all over the news, and have movies, books, buildings, statues, and schools dedicated to him, so desperate are evolutionists on this matter. For something to be a law of science, it can never be found to have been violated, even once, over thousands of trials. No exceptions. A theory that violates two laws of science is in big trouble. The second trick they use is to say that "when you freeze water, the disordered molecules become beautifully ordered ice crystals or snowflakes. If water can bypass the Second Law and organize its molecules by a natural process, why not the chemicals of life?" At room temperature, water molecules are bouncing off each other and you have water. When you take away heat and they freeze, water molecules stick to each other with weak molecular bonds, forming ice crystals and snowflakes because of the shape of the H2O molecule. The same thing happens if you put a bunch of weak magnets in a jar and shake it. The magnets bounce around. When you stop, the magnets stick together. They are at a lower energy level. There is order, yet no complexity - just a simple repetitive structure that does not do anything. The Second Law is not bypassed or violated. But guess what. Amino acid molecules that form proteins, and nucleotide molecules that form DNA and RNA resist combining at any temperature. To combine, they need the help of mechanisms in a living cell or a biochemist in an organic chemistry laboratory.17 It means that nothing happens in the primeval soup, the pond of chemicals where evolutionists believe life began. DNA is made of only right-handed versions of nucleotides, while proteins are made of only left-handed versions of amino acids. Yet any random chemical reaction that produced nucleotides or amino acids would make an equal mix of left and right-handed versions of each. Even if the thousands of nucleotides or amino acids needed to form individual DNA or protein molecules were able to combine from this mix, they would be a jumble of left and right-handed versions that could not function at all. Ilya Prigogene coauthored a paper in 1972 that says in an open "system there exists a possibility for formation of ordered, low-entropy structures at sufficiently low temperatures. This ordering principle is responsible for the appearance of ordered structures such as crystals... Unfortunately this principle cannot explain the formation of biological structures. "30 Prigogene won the Nobel Prize in Chemistry in 1977 for research on dissipative structures, such as tornados, for contributions to nonequilibrium thermodynamics, and for bridging the gap between biology and other sciences. Evolutionists wrongly claim he won for showing how thermodynamics could explain the formation of organized systems, from fluctuations in chaos, that lead to the origin of life. They thought he was their hero. Over thirty years later, nothing has come of it. There is no escape from the Second Law of Thermodynamics. It prohibits the spontaneous origin of life and macroevolution. I believe that humans and other creatures came to exist from evolution. People believe in creationism because God said that's how things were made. People believe in God because they want to know that if they do good in life them and their loved ones will go to a better place. They want to be reassured that theres a beginning to the world. I don't blame them. Everybody wants knowledge of where the beginning was. It's upsetting to there's no beginning but rather endless time. They also don't like the thought of nothing happening when you die and just doing nothing and being nothing. No, they are mutually exclusive positions and there is no possible middle ground.